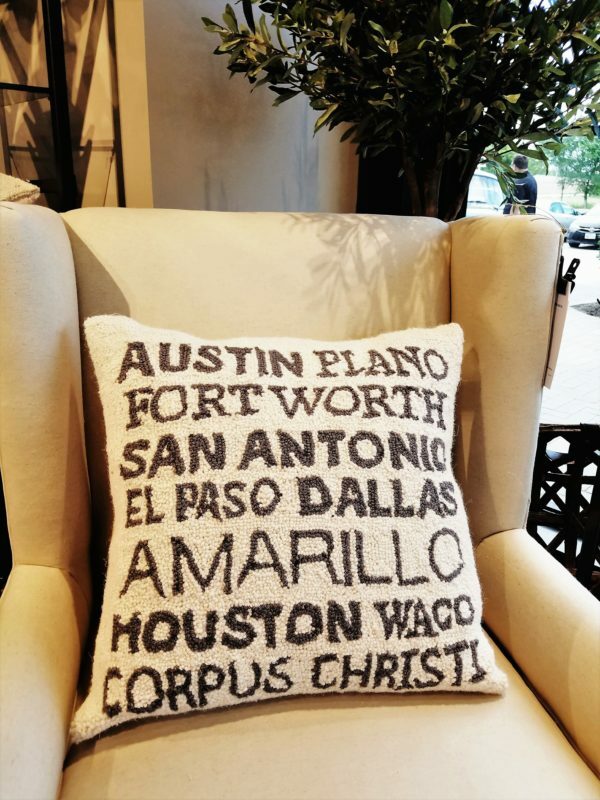 Your home should tell a story. Always changing. Never perfect. Just right for you. Almost 10 years ago, we were searching for a home where we could live as two families — me, Mr. and Miss Bee and my parents. We weren’t quite sure how we could make this home work for us, but we did. Our home had the typical set up with formal and separate dining and living areas but we knew these spaces would not be used in the traditional sense. I put a twist on the dining room and turned it into my “ladies lounge” – a place for a small group of my friends to meet and gather while the men are in the family room. I needed it to also be functional space for my serving pieces and cookbooks so I added two Emerson bookshelves from World Market. 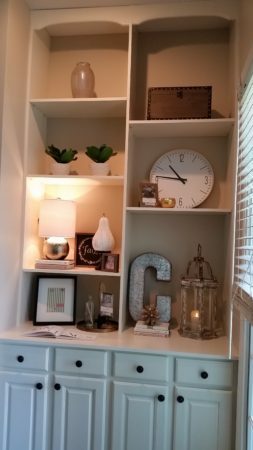 I took inspiration from open shelving where you can go right to the shelf to get what you need to set the table. 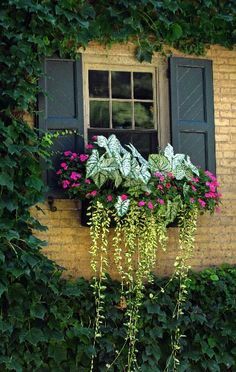 There are tons of ideas on Pinterest. Just type in “Open Kitchen” in the search field and photos like this from Oak House Design Company will pop up. I love stacked glassware, utensils standing up in tumblers, a variety of cake stands, and assorted plates and bowls. If you are considering shelving, I highly recommend the Emerson bookshelves. You do have to assemble them, but they are very sturdy and high quality. Look at the fun hardware on the front and a kick bar on the bottoms. I had my friend Megan from Cleggraphy Designs letter the fronts of these chalkboard boxes from Magnolia Market. I use the boxes to hold a variety of my cookbooks into categories like French cooking, baking and cookbooks good for weeknight dinner recipes. 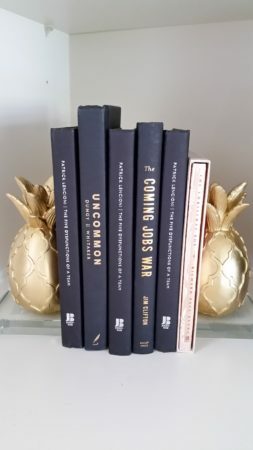 Remember to take the covers off your cookbooks to expose the beautiful colors publishers use for the spines and covers of the books (you can tuck the covers away in a storage box or file if you don’t want to throw them away). The wall color is Sherwin-Williams Quietude. It’s the perfect blue for this space. I had the sofa recovered into a fun animal print. The Erin Cute-as-a-Button chairs are from World Market. The tufted chairs have colorful buttons that add a touch of whimsy. The chairs are neutral enough that I can move them around the house to different rooms depending on my mood. That gorgeous Chiang Mai pillow on the sofa was made by Stuck on Hue. Hollie does beautiful work. Yes, there are three different types of animal print going on in this room and I love it! I had the orange animal print bolster pillows made from left over fabric from this chair in my family room. The blue animal print pillows I purchased at Target, but I don’t think they are available anymore. The beautiful antique library table is made of tigerwood. It’s been in our family for years. The plant stand has a marble insert and belonged to Mother. The cream ottoman is from HomeGoods and is perfect hidden storage to hide out-of-season decor. 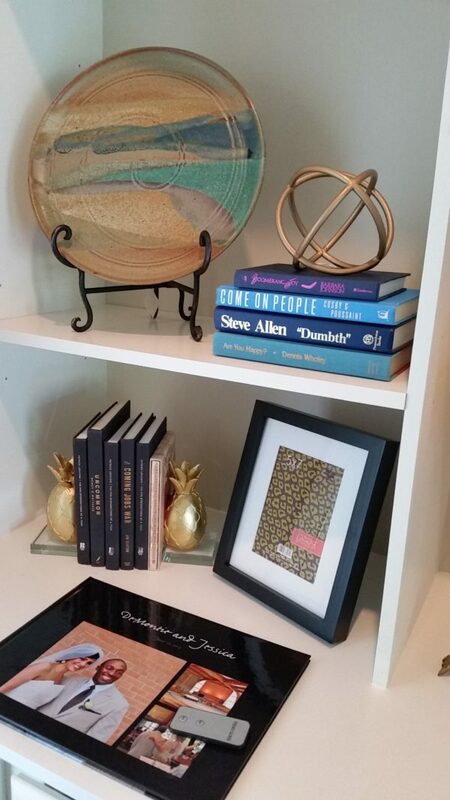 The prints on the top shelf are by Janet Hill Studio of my favorite things — cake! I love my Ladies Lounge. 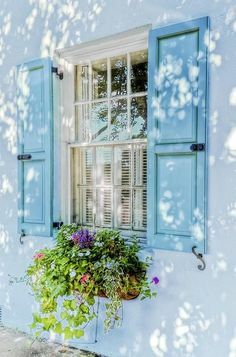 It’s filled with light, fun colors and is a perfect spot to read through my cookbooks and have iced tea with friends. Thanks for taking the tour! I like to refer to my home office as the “Honeycomb Hideout.” Reminiscent of the 70’s television commercial with the Honeycomb cereal, the kids hung out in their tree house talking about grown-ups and ate cereal. Unfortunately, if you look it up on Urban Dictionary they define Honeycomb Hideout as a “place to smoke weed and hide until the cops come.” Clearly, I use my space for something totally different. My office walls are painted “Dragon Fly” by Behr. The color and the wall quote are a carry over from when Miss Bee used this as her bedroom before she migrated to another bedroom in the house. I wanted the inspirational quote to be the last thing she saw each night before she drifted off to sleep. The wall color plays well with orange, yellow, lime green and teal. These little glass boxes were popular back in the 70’s and I am enjoying seeing them on trend right now. It’s the perfect place to tuck my calling cards. I used Mother’s collection of milk glass to display Sharpies and other office supplies. Surround yourself with things that tell a story and give inspiration. The shells came from Gulf Shores, the place I found refuge the first Christmas I lost Mother. The sea glass was found on Orcas Island in Washington during a trip with my girlfriends. My niece gave me the succulent and it loves sitting under my desk lamp. The “hope” rock was given to me by a member of the grief support group I lead at church. I have a stack of Nancy Drew books from childhood. The vintage windup clock I found in an antique store. It is very worn on the back from winding it up. I like to imagine it was used by Doris Day. i found the light box at Ace. I love it. The yellow paperweight and turquoise perfume bottle were Mother’s. The other paperweight is vintage. All sit atop a mirrored tray. I love the peacefulness of the meditating Buddha statue. The last touch I want to share is a little plaque Mother found for me. It hung on the door to my childhood room on 4617 Meadowbrook Drive. She saved it when we moved from that house when I was a senior in high school. I found it in her things after she passed away. 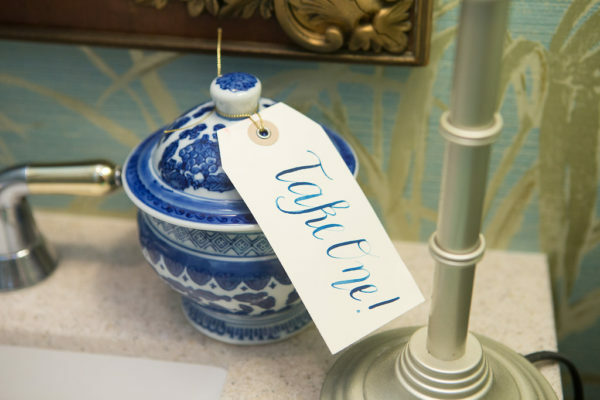 All of these touches — some new, some familiar, evoke the energy and calm I want in my blogging retreat. I’ve got some other fun finds in this room I will share another day. I hope you enjoyed the tour! Here’s an easy project I did a few years ago to re-purpose a wall calendar from Rifle Paper Company, one of my favorite paper sources. I didn’t want to stop enjoying the lovely, floral botanical images so I made them into artwork. I already had frames of a similar type with large mats, a style I prefer, and for the frames that didn’t have a mat I took them to Michael’s and they cut the mats for me to my specifications. I went through the calendar and decided to use pages that meant the most to me — months representing the birthdays of my parents and siblings and our wedding anniversary — February, April, May, June and August. I am really not a DIY gal so I tend to do things in a less scientific way. When it came time to figure out the correct size for each frame, I just laid the glass or mat from the frame on the image I wanted to highlight, traced around the edge of the glass/mat with a pencil, then cut the image with scissors and put the page into each of the frames. Some frames weren’t big enough for the calendar portion of the page, so I just focused on the month or the flowers. Something I didn’t do, but would be fun, is to circle the important dates on the calendar. I’m really pleased with how it turned out. The gallery of art is soothing, beautiful and meaningful to me. Plus this DIY project cost less than $30 for a few pieces of mat board and I recycled a perfectly good calendar. As we near the end of 2016, now would be good time to find clearance calendars to do this project for yourself or as a wedding, baby or housewarming gift. Make a list of what you need or want for your space. 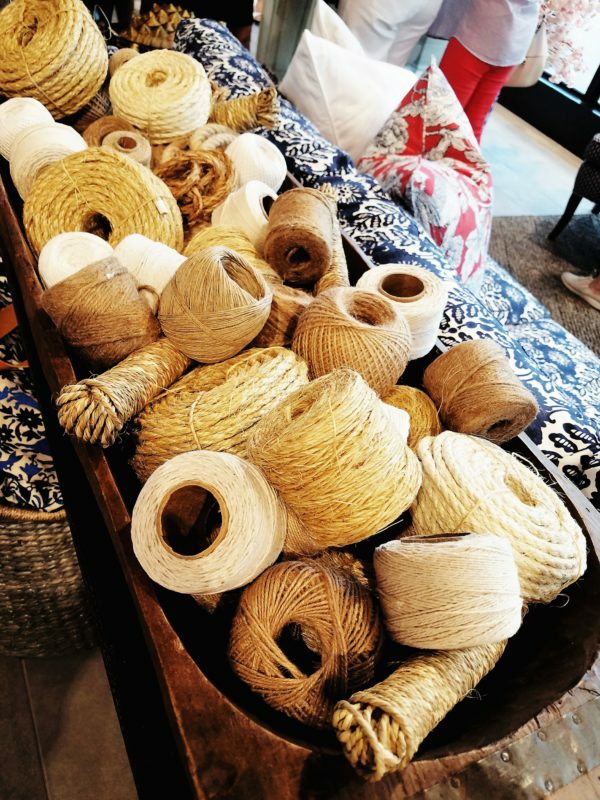 This specific shopping trip was to find some pieces for our outdoor entertainment space that “tell a story” and create conversation. Walking into an antique store with tons of booths is fun, but can be overwhelming without a vision of what you’re searching for. You’ll get distracted anyway with the epic space of nostalgia staring back at you, but at least you can reign in the focus with your list. 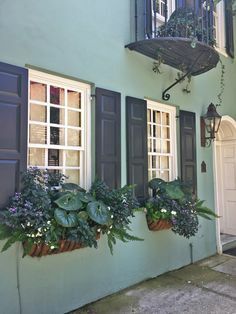 On my shopping list: 1) Something long and narrow for our dining table that I could multipurpose for the seasons; 2) A tall cart on wheels for pool towels and beverages; 3) A drop-leaf, small dining table for extra seating on the patio near the bar; and 4) A schoolhouse chalkboard. Go with a friend. I enlisted the help of my friend Amy. 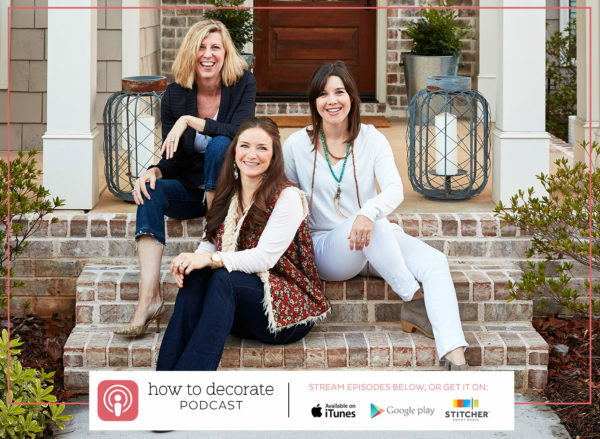 She has a great eye for home decor and I thought it would be a fun way to get to know each other better rummaging through stuff. Friends can help you stay focused, be your second set of eyes because she spotted things I didn’t see…and she was my photographer! In fact, most of the things I purchased on our excursion were inspired by Amy. Be willing to dig, the chalkboard was behind all this. Serious contemplation. Closely look at your treasure. Think outside the box. One item on my list was an over sized, schoolhouse type chalkboard. Amazingly, we found one pretty quick in a booth at the Montgomery Street Antique Mall. The proprietor of the booth, Patsy, told us it used to be on the wall at her church. It was pretty retro with a green background, but the shape and size were not going to work in the space I had in mind. It was fun to hear from Patsy the chalkboard had a history — that for sure would have been a fun conversation piece. However, we did find a 1920’s glass cabinet door in another booth and we thought it could serve the same purpose for writing a menu or message. And, the size was spot-on (see why tip five is important?). Study Your Space Before You Go. One day I stopped in Buy Consignment to see what they had. I spotted a dresser, but my first thought was that it was too large. I took measurements and a photo. The covered patio has vaulted ceilings, a stone fireplace, brick and dark cedar ship lap walls — so it’s a space with a lot of presence. This meant the piece I selected needed to be on a bigger scale to balance the strong structural features. I sat back away from the porch and really studied the spot the furniture would be placed. Another good trick is to tape off the area where the furniture will go to see if it works. I realized it was the perfect size and the scale was proportionate to the space. Something smaller would have been lost and looked out of place. 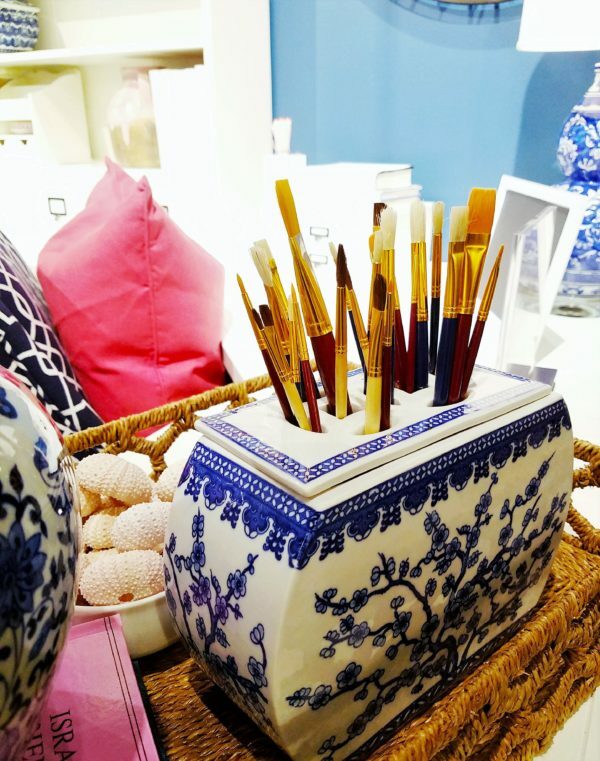 And, I get the bonus of the nine drawers to store entertaining essentials like napkins, plates, cookware, decor. One project I am going to add is a metal cap for the top using an Amy Howard aged, zinc patina product. Stay tuned for that. Measure your space and take a tape measure with you. This sounds obvious, but the only way I knew if the chalkboard and dresser I was interested in were going to fit was to take measurements before I left the house. I also measured my dining table so I knew I could get a large bowl for the top. Luckily, I always have my hot pink tape measure in my bag that I received in my swag from Haven! It’s a game table with a removable top. Checkers on one side and plain on the reverse. It even came with a wooden checker set and four bar stools that nestle into the table, a perfect space saver. This meant I didn’t have to purchase more stools because these can scoot up to the bar. Remember tip #3, to think outside the box? It dawned on me that this served all the purposes I was looking for. While the finish is a little formal for my outdoor space, I think I will ponder a paint finish for it to make it more casual or I may change the covering on the stool tops (think animal print!). I styled it with my copper serving pieces, playing cards and a bowl of popcorn. I can’t wait for our first game night. Here’s where tip #6 came in. The top had a few scratches. It was already marked down to the lowest price, but I pointed out the imperfections, that I was a frequent shopper and could take it right then. The owner gave me an additional 10% off. I did find the wooden bowl and candle holder. Amy suggested I get both so I could change them out, or bring one inside the house for another look. 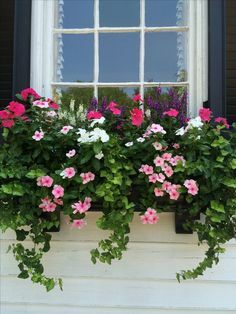 They were perfect for the spaces I had in mind and can be multi-purposed for the seasons. Tuck some moss around the candles. I like LED candles because there’s no mess. Here’s an example of things I didn’t notice when I was there that day. Look at that green grocery cart, the coke bottle holder and in the bottom corner the wooden rolling pins. I may have to go back. This was the booth I got the wooden bowl. Last fall when I went to visit Sister Bee, all I wanted to do was be cozy in her mountain home and read books. She had this book Style & Simplicity by Ted Kennedy Watson on her coffee table. I immediately fell in love with his book and ordered by own copy right then and there. 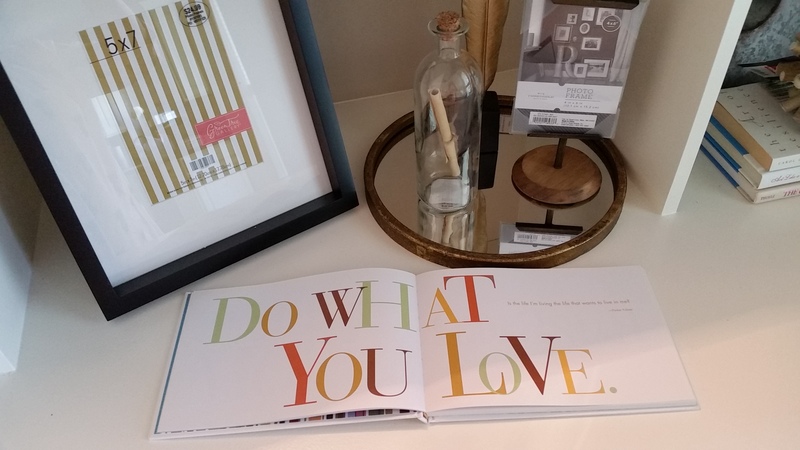 This book is an “A to Z Guide to Living a More Beautiful Life.” Every letter of the alphabet is represented in a how-to guide to decorate your home and entertain your friends. Years ago, Sister taught me to copy what you see in magazines and books. She was the original Pinterest. 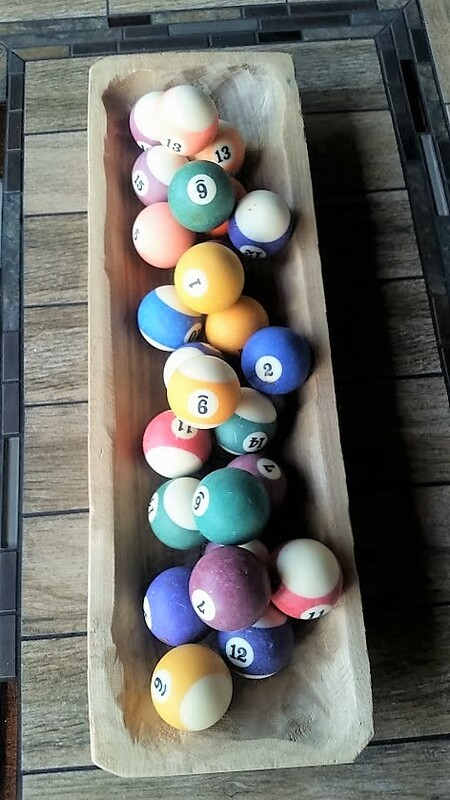 A bowl of billiard balls. How clever. I tucked the idea away in my head. 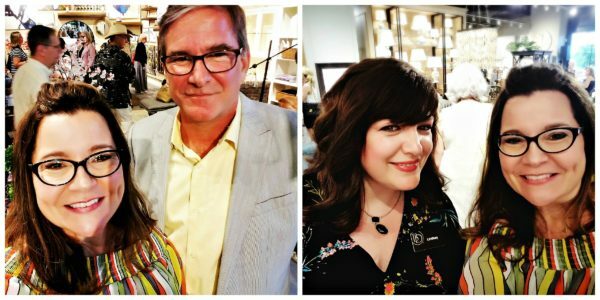 A few days later, Sister and Miss Bee and I went antiquing in Capitan — home of Smoky Bear. 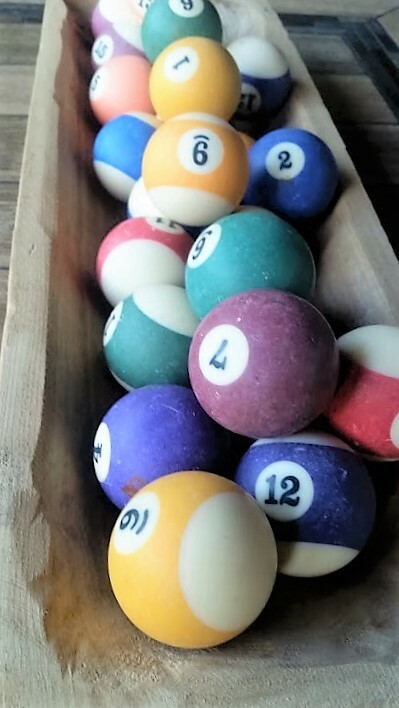 We were rummaging around and I saw a milk crate full of vintage billiard balls. 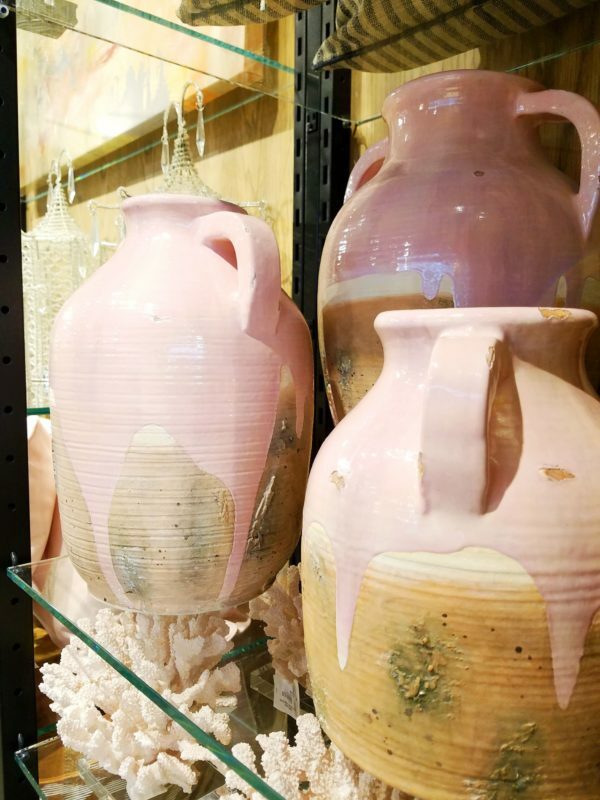 Heavy, nice ones with soft colors and not plastic. I lugged the crate to the owner and asked her real kind how much. “Oh, how about $20 for the crate.” Sold! Of course, it cost about $40 to ship them home with the other treasures we found that day, but it was worth it. 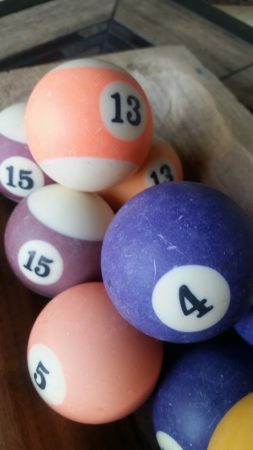 I have been doing a little research and I think the balls might be Bakelite! 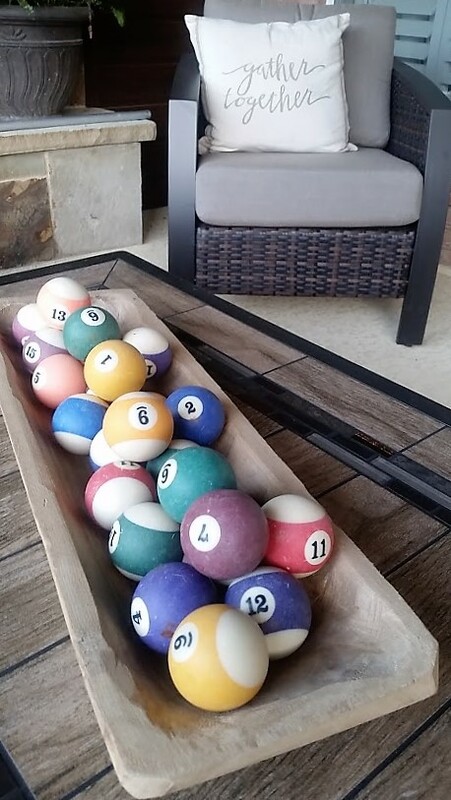 We’ve been adding covered entertaining space on our patio and I wanted to fill the space with fun, vintage, quirky finds and these billiard balls are perfect conversation starters. All they needed was a good wipe down with a damp cloth. I found a carved wooden, long bowl at Hobby Lobby and filled it with my treasure. It was like it was meant to be because there were just enough to fill the bowl! I’m still searching for things and will be showing you more unexpected finds soon. So, next time you look through a magazine or coffee table book, slow down and really take in the possibilities for your own home. 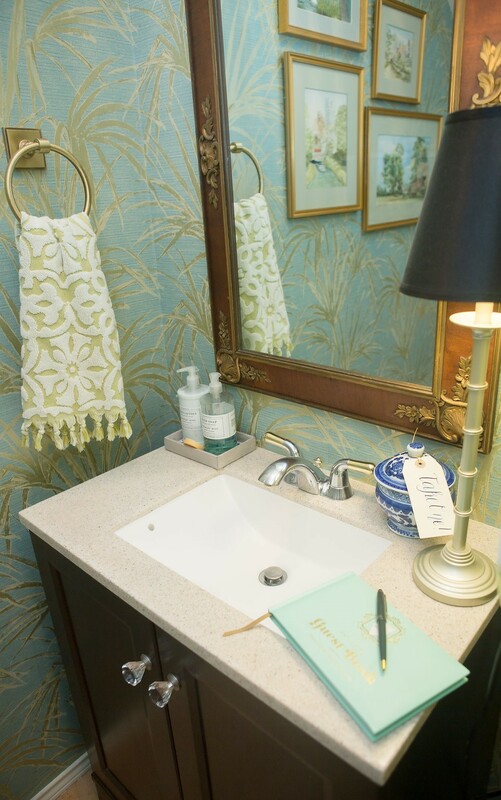 By definition, a powder room is a small bath for guests with a sink and toilet, but not a tub or shower. 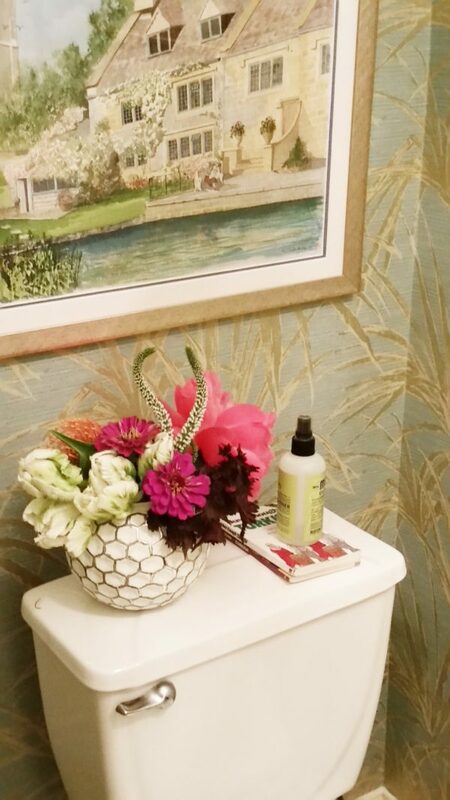 My powder room has gone through the most makeovers in the house. A tiny bath for just one person is hard to keep light and airy. I’ve painted the walls, the ceiling, tried different art work, mirrors and finally I decided the only solution for this room was wallpaper. 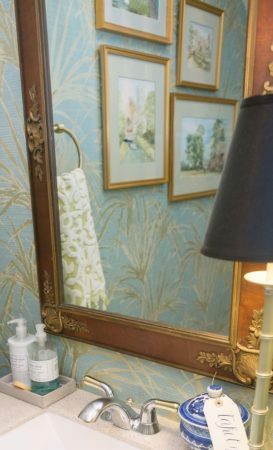 And, not demure paper, but the type of wallpaper Blanche Devereaux would have (you know, the gal on Golden Girls?). Growing up, my mother loved wallpaper. At 4617 Meadowbrook Drive, my childhood home, we had a distinctive bamboo green and white paper in our entry way. So it was probably imprinted on my brain since birth to have bold wallpaper in my own home. It’s a light aqua blue, with a grass cloth texture and shimmery gold, bronze palm fronds. I knew the minute I received the sample in the mail it was what a I wanted. I added Mr. Bee’s collection of water color prints, each painted by his father of his childhood home in the Cotswalds of England – one large print above the toilet and four more prints on the entry wall. I framed them in matching gold frames with a light blue mat. It’s lovely to walk into the room and see my father-in-law’s signature on his art. We installed a sink and cabinet from Home Depot. A brass towel ring and toilet paper holder from Pottery Barn, a candlestick lamp, and fringe hand towels. The mirror was Mother’s and is probably 50 years old. I love the gold, ornate features. 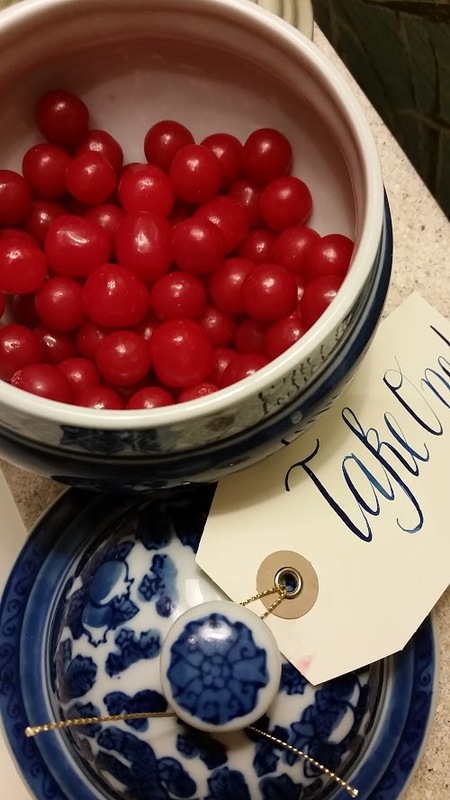 A bowl of sour cherries! One of my favorite things. I thought it would be a nice gift for my guests – kind of like after dinner mints. 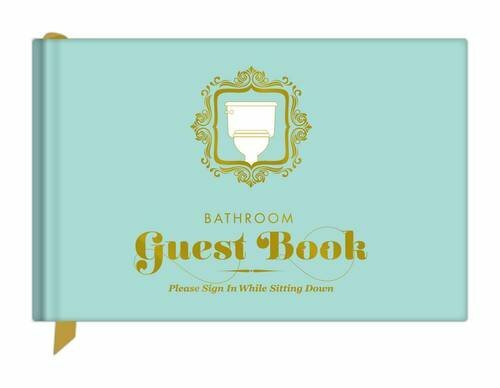 And another conversation piece…A bathroom guest book from Knock Knock — please sign in while sitting down. 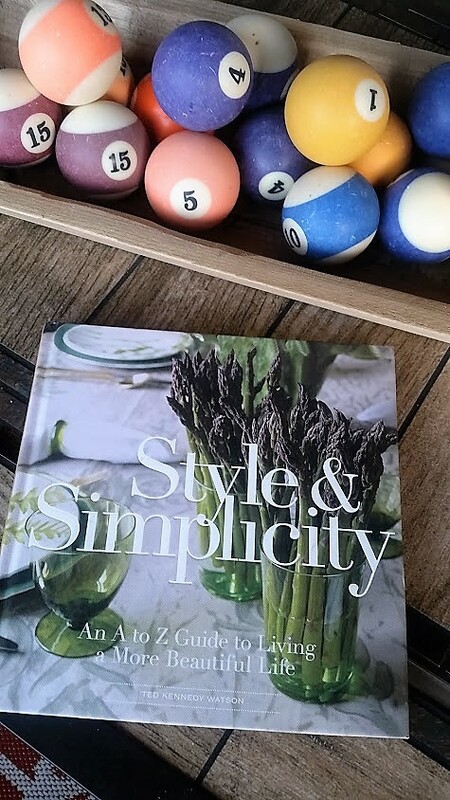 My friend Terry has this book and I couldn’t wait until I got one for my powder room, too. It’s the funniest book…guests can rate your amenities, leave comments and doodles. After a party I love to see what messages people left. So, that’s the powder room. Hope you enjoyed the tour! I had the fun opportunity to visit my friend, Jess, her husband and 10 month old baby for a few days and see her new home. Jess was my personal trainer and we developed a wonderful friendship. Sadly, for me, she moved away to be closer to her family in Missouri, but we have stayed in touch. While I was visiting, she enlisted my help in decorating her new home. 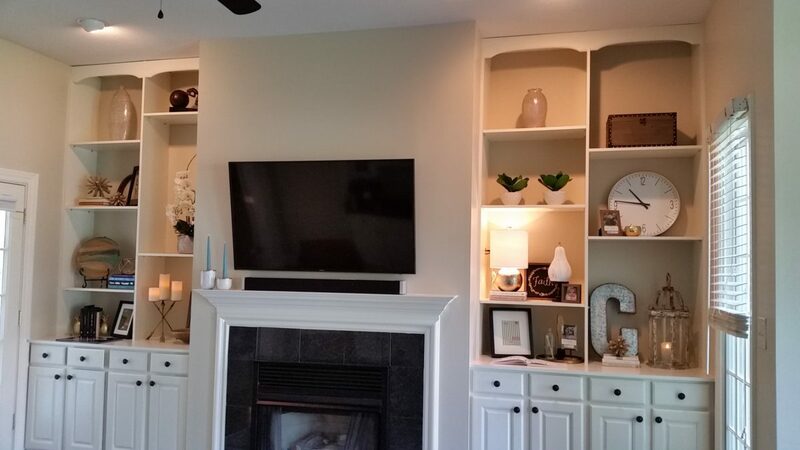 We decided to style her built-in shelves in her great room. This room is one big room with her kitchen and dining area. It will be the perfect space to entertain and gather for family meals. 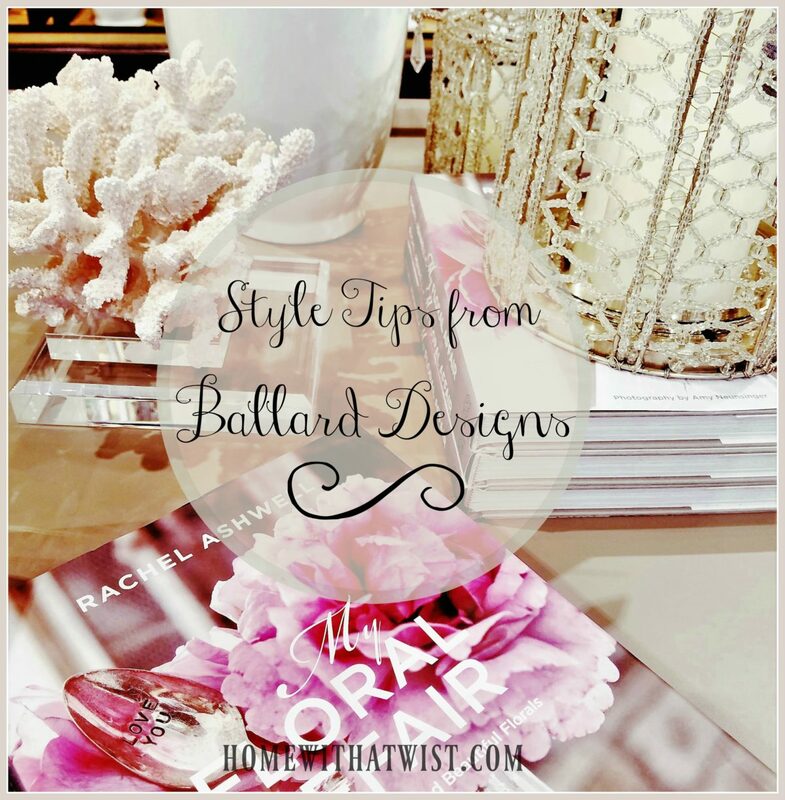 One of my favorite things to do is style shelves. I think it comes from growing up on Meadowbrook Drive. Mother always had built-ins and she loved to stack books and treasures. Jess was a willing participant and had an idea of what she wanted the finished product to look like. We decided to go with items that had texture, varying heights, and looked like “found” pieces. It was really important to Jess to use neutral, minimal color. She is going to pull in color with pillows, a throw and flowers. Jess has only lived in the house a few weeks. So what was put on the shelves was literally unpacked from a box and placed so the boxes could be disposed of. Before we went shopping we snapped pics of the bookshelves to help us make our choices at Target one evening and Hobby Lobby the next day. Once we got home with all the purchases, we cleared everything off the shelves and adjusted each shelf so they were varying heights. We unwrapped everything and laid it out on the floor. I also shopped her house for other items, in particular books. A very simple trick for bringing color into your room, is removing the paper covers off your books to expose the spine. I like to group books into color categories. If it’s important to you to retain the covers, then put them away in a file folder to reunite them later on. Jess didn’t care so we threw the covers away. 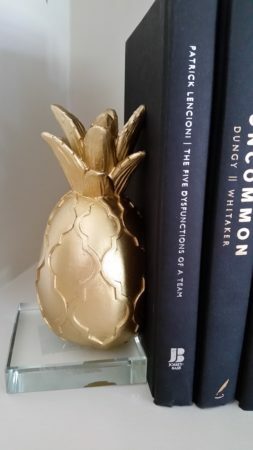 These gold pineapple bookends from Hobby Lobby were only $24.99. 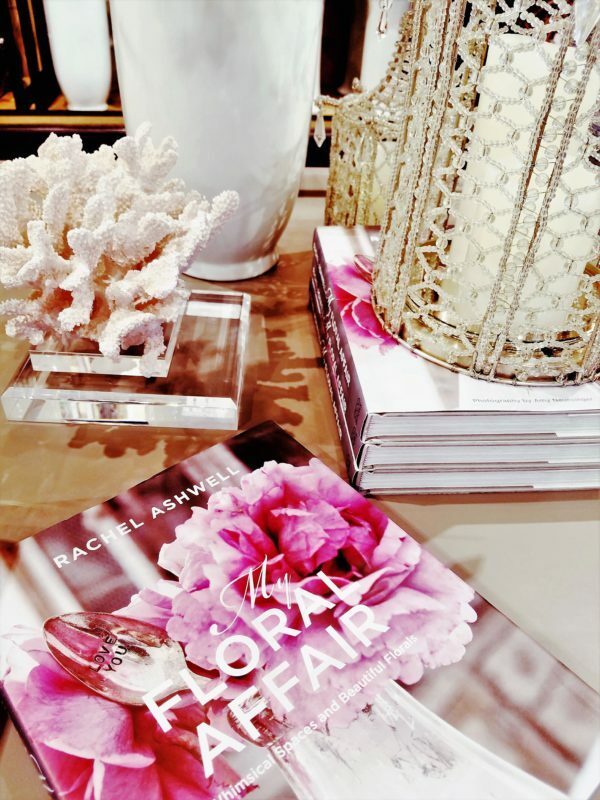 Set upon a lucite base, they look very high-end. See how we grouped the books with all the dark spines together? This was one of Jess’s books, a gift from her mother. I loved it because each page held a different quote. 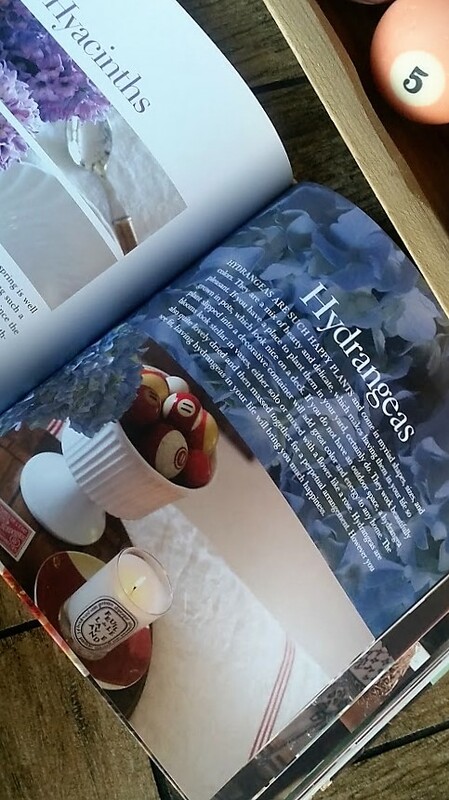 Another fun tip is to open your coffee table books to a beautiful page to add interest. Turn the page when you want a new pop of color. When her mother comes to visit, it will please her to know her gift is on display. The mirror is actually for the wall, but in this case we used it as a tray. She can always change it up and hang it on the wall later. The frame (which Jess will fill with a photo later) was from Target. We liked the wooden base. 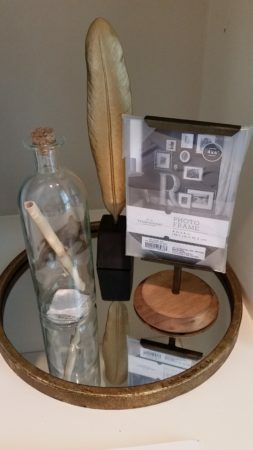 I loved the message in a bottle and gold feather we found at Hobby Lobby. 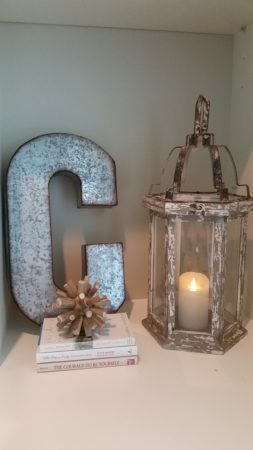 The galvanized “C” we will hang on the wall. Don’t be afraid to hang items on the backs of your bookshelves. 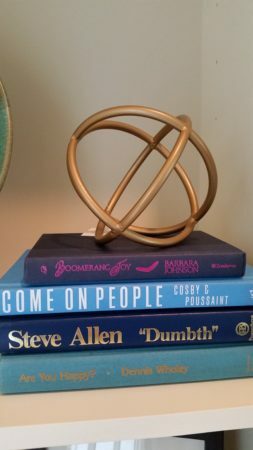 I placed a fun wooden sphere on a stack of books. The lantern is one of my favorite pieces. It’s chippy and looks like a found piece. The best part is we bought a set of LED battery candles. With a switch of a remote she can get beautiful candle light without the worry of a real flame. 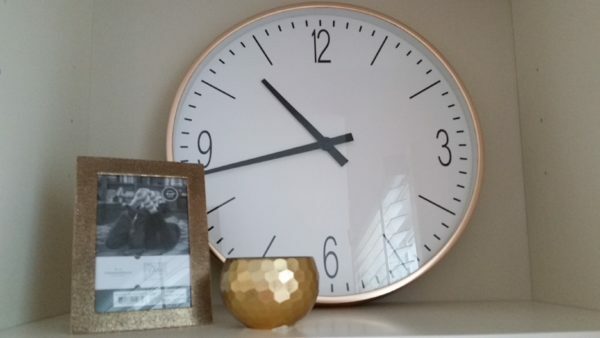 The clock is also from Target and she will hang it on the wall, although, I like the unexpected touch of it leaning on the wall. We grouped it with a frame and gold votive tea light. 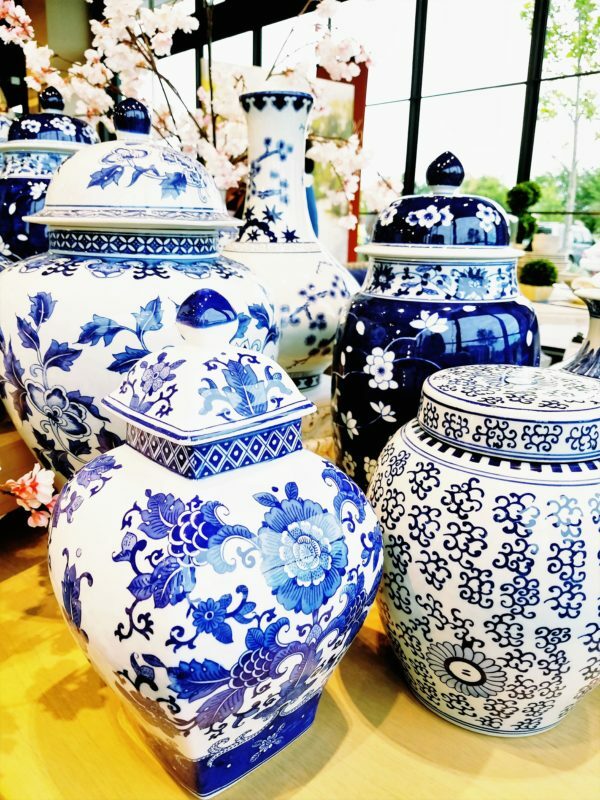 When you are arranging decor, try to group items in odd numbers, like 3s and 5s. If you look back at the beginning photo you will see we adjusted the shelves to be seven compartments. Anytime I can, I love to add the warmth of a lamp. 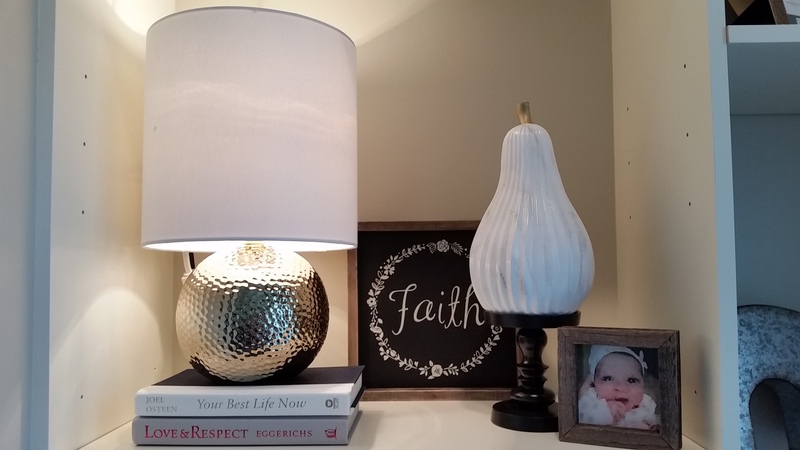 She had a outlet so I knew we could add this hammered lamp she spied at Hobby Lobby. It’s silver, but don’t be afraid to mix it with other metals. Jess’s favorite piece of everything we found is the marble pear (which actually isn’t marble, but resin) placed atop a black candle holder from Target. The pottery plate and bowl, the vase and sculpture were shopped from her home. 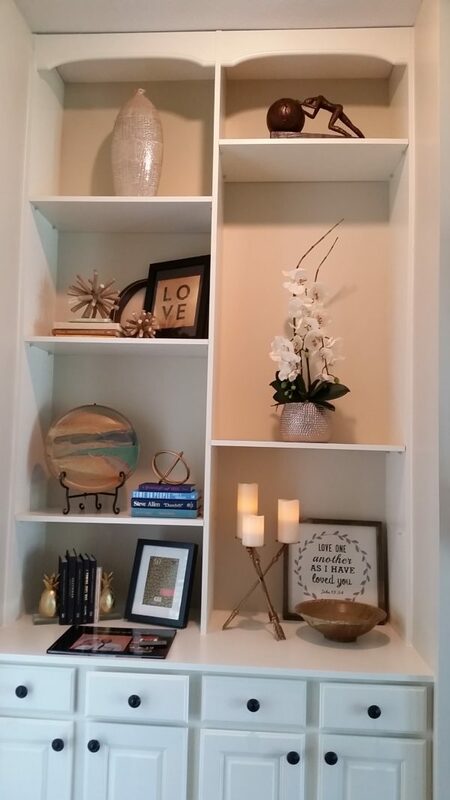 Jess loved the idea of an orchid and it fit perfectly in the shelf as the tall accent piece. 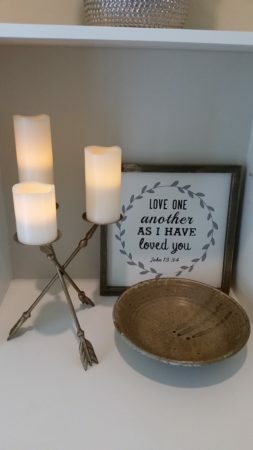 I love the arrow candle holder we found at Hobby Lobby. Again, we used battery candles. Jess is going to fill the bowl with green apples for a pop of color. The beautiful, framed scripture came from Hobby Lobby. We found the gold sphere at Hobby Lobby, put it atop a stack of blue books. 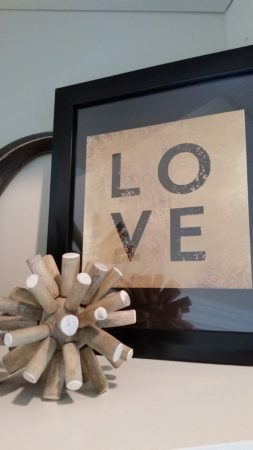 The LOVE print Jess already had and we grouped it with the coordinating wooden sphere. Jess and her husband loved the finished product and I have to say I do too! The room looked so put together and zen. It will be the perfect space to relax. I am really proud of well Jess did carefully selecting things and embracing the change of her space. I can’t wait to return in the fall to help her again with another room. Welcome home Jess! My friends at Chairish asked me if I would come up with ideas for creative ways to use an Armoire. That was a challenge I happily accepted! 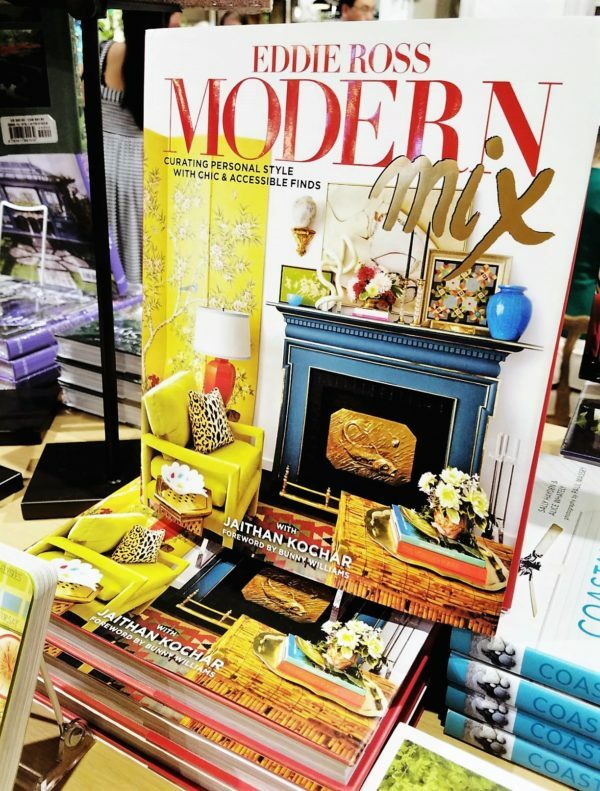 I love re-purposing furniture and coming up with new ways to take something traditional and put a modern twist on it. By definition, an armoire is a tall free-standing cabinet typically used for clothing and storage. It’s very popular in European countries to have an armoire instead of a closet. 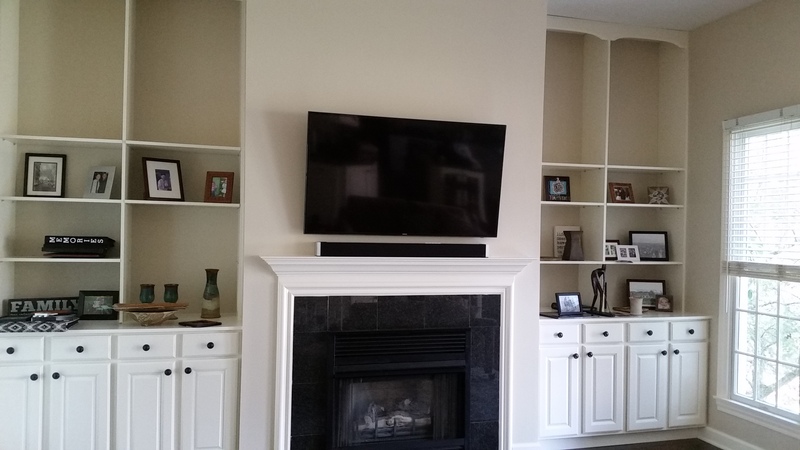 In the 90’s, we saw a resurgence of using armoires for the television and media storage, before wireless brought the wall mounted television. It occurred to me that often times in the summer months, we stash things in those plastic pool benches, or have to lug everything from inside outside, then inside again. 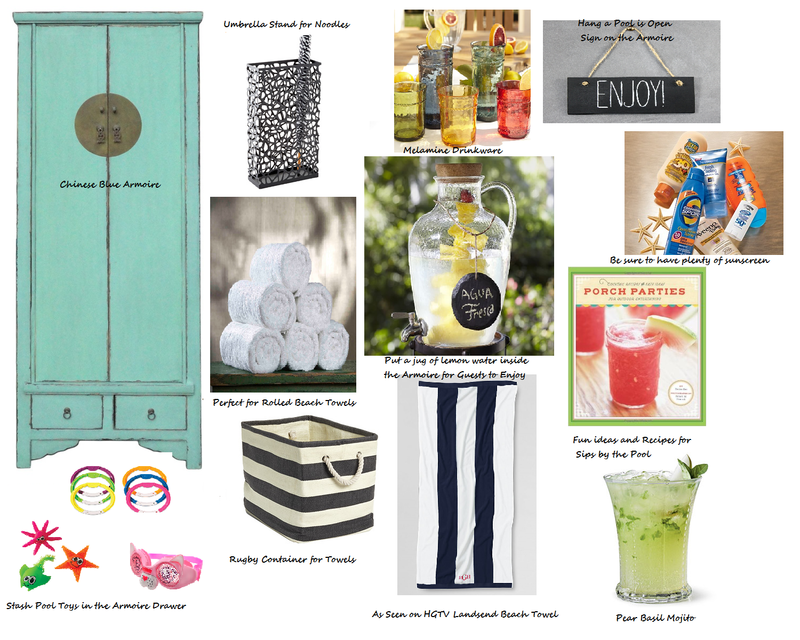 Wouldn’t it be fun to organize all your outdoor entertaining needs in a stylish, pretty armoire? 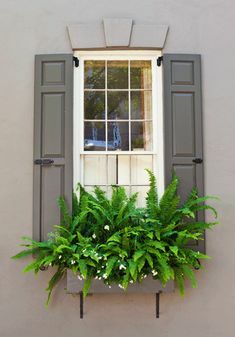 Obviously, you need to make sure you have a covered space so this gorgeous piece will be protected from the weather. This is just a concept to embrace. A coat of marine varnish on an armoire could protect it from the elements. Roll up your beach towels and either stack them on the shelves or stuff them in this fun Rugby-Striped Bin from The Container Store. The beach towel is from Lands’ End. 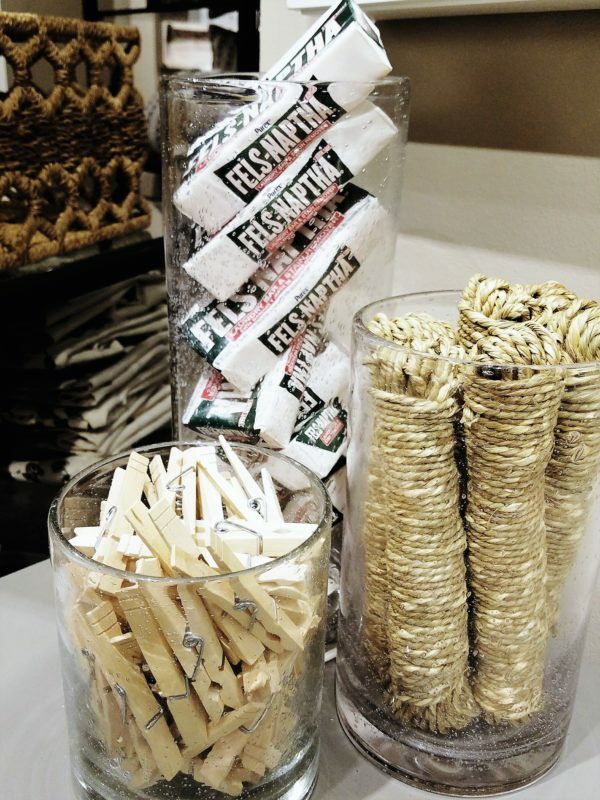 Store noodles upright in the umbrella stand from The Container Store. Pottery Barn is having a great outdoor entertaining sale. Melamine is perfect for dining al fresco. A jug of fruited water placed on the shelf inside the armoire means you won’t have to make trips inside for beverages for the kids. Your friends can sip this recipe for a Pear-Basil Sipper. Porch Parties is a charming book full of recipes and inspiration for outdoor entertaining. Always make sure you have a generous supply of sunscreen available for guests. You can easily store extra bottles and a first-aid kit in the armoire drawers, along with pool toys. 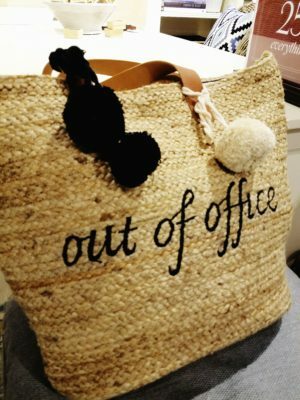 Lastly, I thought a chalk board would be fun hanging from the door knob letting guests know the pool is open! 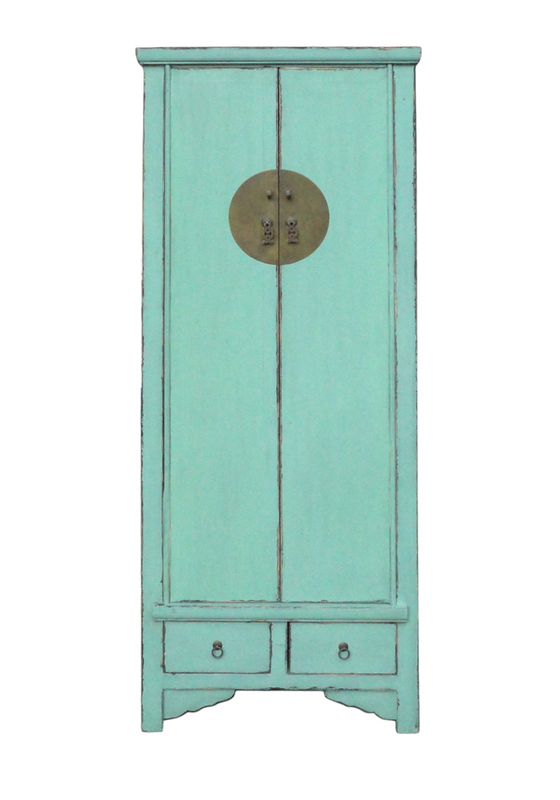 Check back soon for Part-Two to see what armoire I choose next…Thank you Chairish for the fun homework!